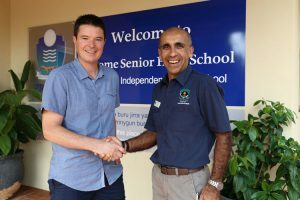 It is with great pleasure we’re able to announce Mathew Burt as the new principal at Broome Senior High School commencing in 2018. Mr Burt is an outstanding appointment, currently the Associate Principal at the new Fremantle College, having previously been Principal of Atwell College and Como SHS (both in Perth). We are extremely lucky; Mr Burt is very highly regarded and was being coveted for a number of Principal positions in Perth but has chosen Broome. Mr Burt will move here with his wife (who is a teacher) and two children. Their daughter will be in Year 7 next year here at the high school, and their son in Year 5 at one of the primary schools. Both Jacqui Mackay (our Board Chair) and I were involved in the selection process and we are absolutely delighted; it is a fabulous appointment.